Indian Couture Week is all the talk of the town now – With the best of the best showcasing the finest in couture and Indian bridal fashion. Day 1 saw Manish Malhotra’s ‘Persian Story’ and had our faces turned into heart-eyed emojis with every outfit we saw. For real. 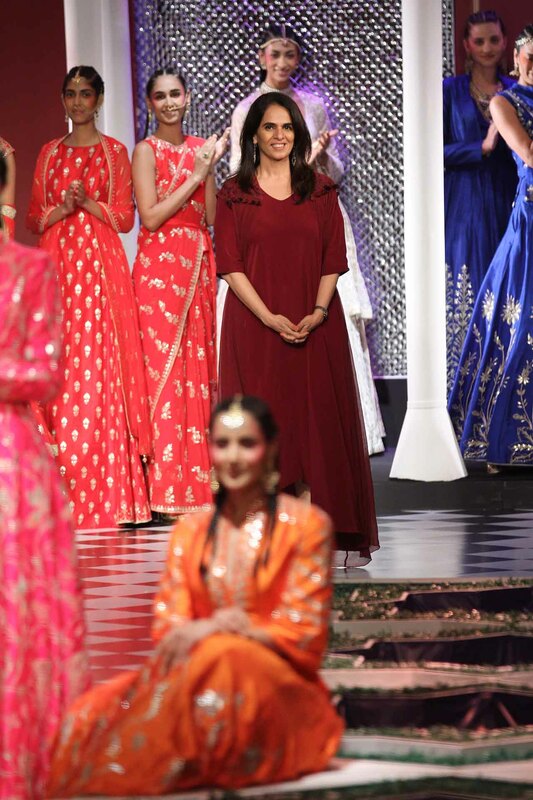 And we couldn’t wait to see what Day 2 had in store with Anita Dongre’s showcase. Epic Love opened on a subtle note with light lehengas and flowy silhouettes with boho blouses which slowly developed into Indian bridal wear featuring the designer’s signature gotapatti work in flared jacket-lehengas, lean-cut straight kurtas and sherwanis that took our breath away! . 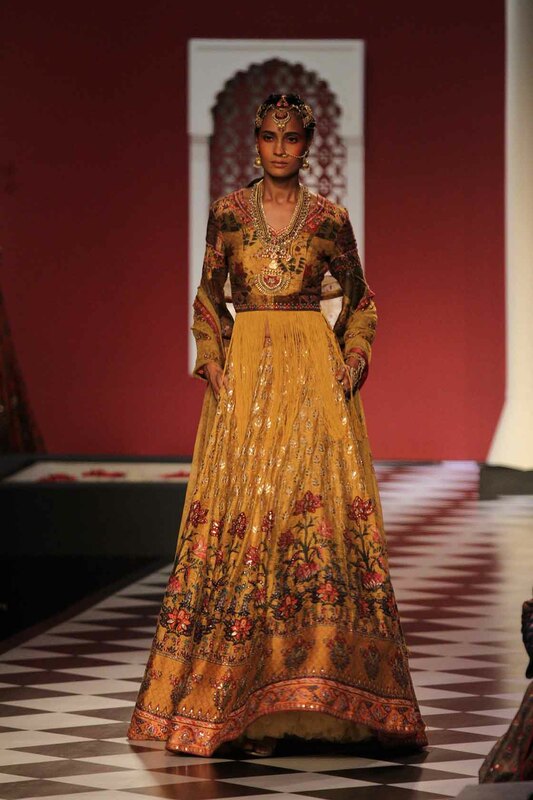 Gotapatti work is seen across the collection – first on the prints and then teamed with thread work. Using tones of burnt orange, creams and gold along with aubergine purples, wine and regal reds teamed up with tassle detailing and embroideries that brought on a Rajasthani charm. Burnt and bright orange beauties - Anita Dongre brought on a folk-ish feel to the table with intricate embroideries touched with tinges of gota and tassles. Navys, Royals and Ink blues - tones with elements of tiny pinks and reds complemented with gold had us swooning like never before. Aubergine purple and black jacket styled lehengas and dhotis with a mandrin collared jackets. Additional details of tassles and belts only upped the style quotient on these stunning outfits! Anita Dongre does pink right! Pairing the classic bridal saree and lehenga with jackets and capes - Geometrical figures and nature inspired patterns dominated the pink section! Navys never looked so good! We lovelove the jacket-styled blouses and Floor length pakistani inspired kurta! Red and Gold and Indian weddings have an age-old love affair. 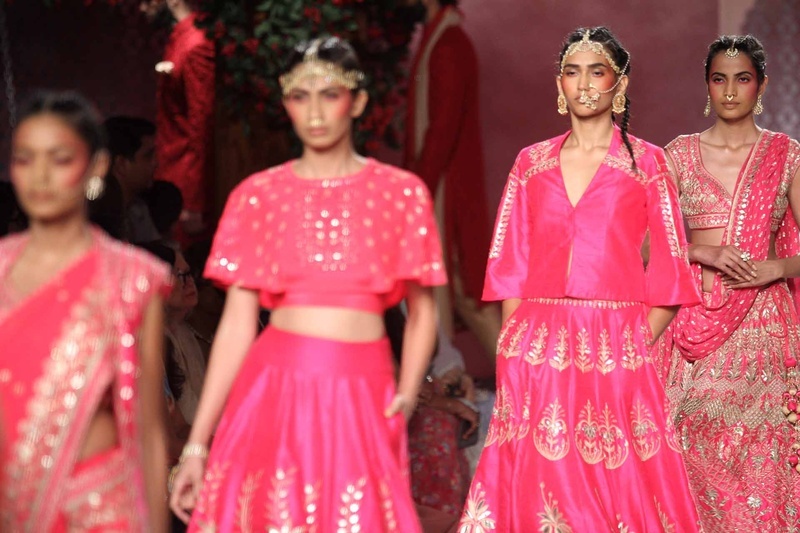 Anita Dongre successfully reingites this fire with a set of her collection in regal reds with accents of gold. Tones of white paired with pastel palettes of pista green, peach and cream. 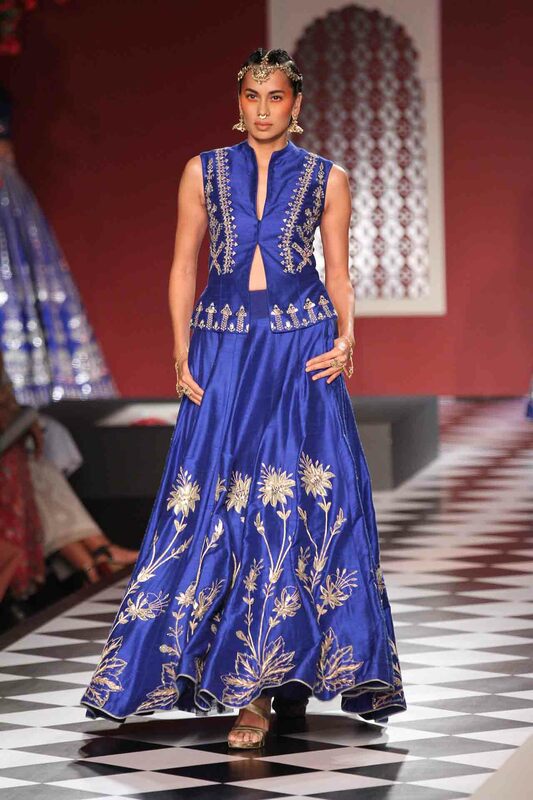 Stunning silhouettes kept to classic straight cut sherwanis and beautifully flared lehengas. The woman behind all the magical creations - Anita Dongre!